I couldn’t resist jotting some thoughts on my reaction to the recent and much-anticipated Royal Opera House production of La forza del destino, starring Jonas Kaufmann, Anna Netrebko, Ludovic Tézier, and Ferruccio Furlanetto, even though I’m not very familiar with this opera. When I first became infatuated with opera, I saw a recording of the Kaufmann/Harteros/Tézier version from Munich of several years ago, but that was the only complete version I’ve seen. I was intrigued, but a little confused by what seems a fairly simple story. Perhaps it was some directorial choices that made certain things unclear, whereas many who saw it were probably well familiar with the story from other versions and had no trouble following along. In essence–SPOILER ALERT–the story begins in the home of the Marquis of Calatrava, who believes that his daughter Leonora has gotten over her infatuation with the foreigner, Don Alvaro (an Incan prince from the Americas). In reality, they’ve planned an elopement, and Don Alvaro shows up that very night, and overcomes the reluctance of Leonora to fulfill their plan. They are caught, however, by the Marquis, accompanied by the pursuing “destiny theme” in the music, and provoke a fight with Alvaro, who has tried to take the blame on himself. Alvaro, in trying to hand over his gun, accidentally shoots the Marquis—who, with his dying breath, curses his daughter. Both Leonora and Alvaro flee the same night, but not together; she believes he has escaped, perhaps gone back to his homeland. After overhearing her brother’s plan to find and kill his sister in order to avenge the family honor, Leonora begs Padre Guardiano to let her follow in the footsteps of another unhappy woman, and to commit herself to the life of a solitary anchoress in a cave near the friary. After some resistance, Guardiano agrees to support her. Meanwhile, after having sought Leonora for a year and now believing her dead, Alvaro joins the fight for Italy against the Germans. Rising in the ranks, he ends up—under another name—saving his foe, Don Carlo (who is also going by another name), and the two swear eternal brotherhood. Alvaro, having become mortally wounded, gives Carlo the key to a box that he keeps, revealing his identity, and asks Carlo to burn the contents. Carlo finds out the identity of Alvaro, and is eager that he should be healed–which is what happens–in order that he may kill him himself. Carlo reveals to Alvaro that Leonora is alive, but will die by his hand. After presumably both time and a game of cat-and-mouse searching have passed, Don Alvaro ends up committing his life to the friary in order to expiate the misdeeds of his past, and is much beloved by the populace. Finally, his whereabouts are discovered by Carlo, who provokes the dormant ire of the now-nonviolent Alvaro; they duel, ending up disturbing the peace of the nearby (dying) anchoress Leonora; Alvaro strikes a mortal blow at Carlo, and as the latter is dying Leonora and Alvaro recognize one another, and the dying Carlo, unrepentant still, kills his sister. During her final, peaceful passing, Alvaro finds in the situation and in her words assurance of his own redemption in spite of the brutal force of destiny. “Riva’s play ends, after the duel and the death of Leonora, with Alvaro’s suicide. He rushes to the cliff edge as the Father Superior and the monks appear on the scene. When the Father Superior calls him by his monastic name, Rafaele, he cries: ‘You can search for Father Raphael, you fool. I am a messenger from hell. I am the spirit of destruction….Hell, open your mouth and swallow me. Let the heavens collapse! Let mankind perish!’ And, with a final shout of ‘Extermination, Annihilation”, he flings himself over the cliff….The gentler ending as we know it today stems from the Milan revision of 1869” (Osborne 336). Anna Netrebko’s low, melancholy soprano and the passionate but sadly tormented demeanor are a great fit for Leonora, and although Jonas is the only Don Alvaro I’ve seen, he fits the role beautifully with his winning charisma as well as his dark and dusky tenor voice and his phenomenal acting ability revealing the character’s guilt-ridden torment. 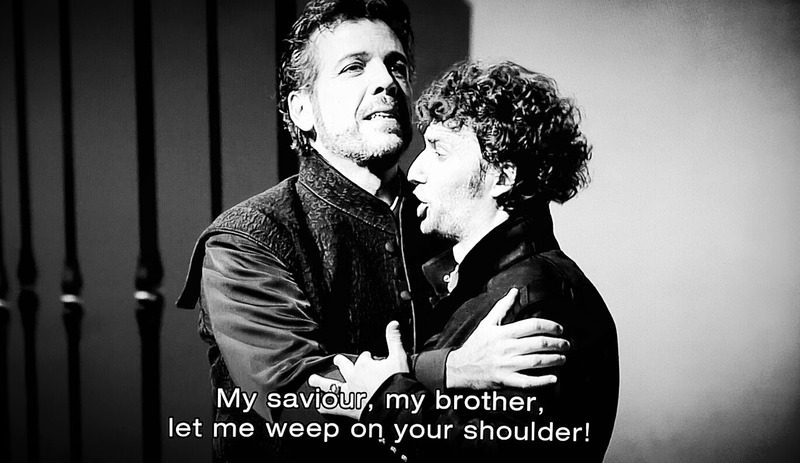 Ludovic Tézier is a brilliantly cold Don Carlo, whose rich baritone mingles so beautifully with Jonas in their scenes together; the two always have the most compelling chemistry. Theirs is the friendship that might-have-been; it is for me possibly the greatest tragedy in the story. The extent of Don Carlo’s need for revenge goes beyond any kind of bounds of honor; it becomes sheer passionate excess; but one sees, in the budding friendship before he realizes the identity of Alvaro, the potential that this character has. The gorgeous friendship duet, “Solenne in quest’ ora,” is breathtaking. I liked the simple staging and updated dress, whose time period was a little hard to pin down. The glimpse into Leonora’s childhood with an abusive brother, which we witness during the overture, makes an imaginative and helpful background for Carlo’s fanatical, Javert-like pursuit of his sister and her would-be lover. Thankfully, Christof Loy’s direction is neither overly-symbolic nor unnecessarily ambiguous; any interpretation that can be attached to it is something that one considers only in hindsight—at least, this was my experience—because the drama takes precedence. In Loy’s use of the background film projections of close-up, exaggerated reactions of the prinicpal characters, generally in slow-motion, I was reminded, as was my friend Viv whose review I would love to link here if I can find it on a public site, of the Warlikowski Don Carlos of Paris, 2017, though I don’t believe Loy’s was as creative and inspired as the latter overall. Another curious stage choice was that, whether in the Calatrava household or later in the friary, we seem to be in the same “setting”–a dining room of sorts—and I couldn’t help but wonder if the director wanted us to believe that Leonora was simply exchanging one kind of submission (that of a daughter to an overbearing father) for another (that of an anchoress to a religious father). I appreciated the “deeper logic” that the director was trying to get at in the staging, with the recurring room perhaps more reflective of Leonora’s consciousness and her tormented memories, than the real setting itself. In terms of direction, the only thing I had a negative reaction to–because it took me “out” of the drama, as not entirely making sense except in terms of directorial imposition–was the scene where the friars are accepting their new “charge,” their new anchoress who will dwell in the cave, after Leonora has persuaded Padre Guardiano to allow her this chance. At a certain point, the mood of the scene changes from the somewhat daunting, somber and inspired piety of the action, to one where Leonora seems to have a last-minute change of mind, but the monks physically force her to stay and she ends up in a restraint position on the ground. Here again, I felt a little bit of the director’s imposition: the idea that she has merely exchanged one form of submission for another. To me, this undermines the strength of the love-sacrifice of the story, and the strength of Leonora’s character. After all, however misguided Padre Guardiano was in agreeing to it, it was her request and her resolve that won the day, and I think we need to respect that in the storyline, as it shows no little strength of character. We are dealing with people of a different time and different ideals, including those of the Romantic—often to the point of melodramatic—19th century stage here, and, in my opinion, the piece is more poignant if played straightforwardly and as though the characters are acting out of their authentic convictions, and not with our own 21st-century abhorrence for the extreme choices of cloistered, consecrated, or eremetic life, with the added submission to authority that is inherent in such a choice. So, while I see what the director was saying, it was, for me, a momentary misstep. In terms of Pappano’s brilliant conducting and the beauty of the orchestration, nothing could be better. The thrilling final scenes, the Don Carlo/Alvaro duel, and the heartbreaking look on Jonas’ face which brought tears to my eyes—all made for a brilliant finale. My next Forza, I think, will be the 1958 video recording with Corelli, Bastianini, Tebaldi, and Christoff…and very much looking forward to it! But I also look forward to revisiting this one; I very recommend this production, which was a good vehicle for an excellent cast and orchestra of this strange and poignant opera. Speaking of “malaise,” the overworked pace of 2018 kept me on a restricted opera regimen–and, actually, a restricted regimen of any life outside of work!–and I regretted having missed most of the Met’s HDs and radio broadcasts and many of the other broadcasts I would love to have seen and heard. (I’ve generally been MIA from my favorite opera groups online. I miss my dear opera pals so much!) However, things are looking up, and on this restful Sunday morning I’ve been spending time reviewing the recent announcements on the Met’s 2019-2020 season, both on stage (radio, for me!) and cinema. Overall, nothing stands out in the way that La Fanciulla del West did this past season, with the return not only of this too-little-performed Puccini opera, but of Jonas Kaufmann. Nor have any of my long-term hopes been realized: another big HD role for John Relyea and Štefan Kocán–both of whom are notably absent from any Met performances in the coming season; nor my perhaps quixotic hope that the Met will one day put on a gloriously heartbreaking production of Don Quichotte with Ferruccio Furlanetto, capturing this iconic role in HD for the ages; nor yet the promised all-star Don Carlos in the 5-act French version. Nor do I see anything with King René Pape. On a few underwhelming notes, what we do have are some of the standby, albeit beautiful Zeffirelli productions–La Bohème, Turandot. (Frankly, I was hoping that they wouldn’t HD the latter again until Jonas Kaufmann finally sings Calaf.) We have an Anna Netrebko feast, with her special concert, as well as the reprisal of her Lady Macbeth and Tosca roles. But we also have Marco Berti back, and Aleksandrs Antonenko. To hear the great Luca Pisaroni‘s Guglielmo and Gerald Finley‘s Don Alfonso in Così fan tutte, although not an HD of the season, alas. The return of Sir Bryn Terfel, in Der Fliegende Holländer, conducted by Valery Gergiev in a new production. Stars such as Elīna Garanča, Bryan Hymel, and Ildar Abdrazakov in Berlioz’s Faust. Morris Robinson’s Sarastro, although the shorter, English Magic Flute. Diana Damrau and Jamie Barton in Maria Stuarda. Angel Blue and Eric Owens in Porgy and Bess. 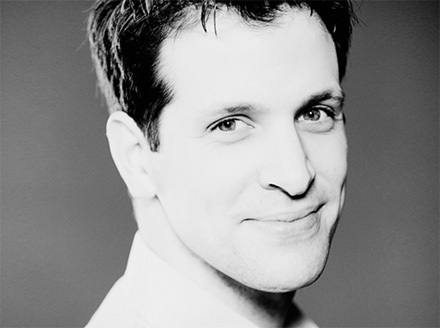 Luca Pisaroni again, as Figaro in the Nov/Dec Nozze. Luca Salsi as Germont in Feb/March La Traviata–though I’m not overall a huge fan of the opera–and Quinn Kelsey in the Jan/early-Feb performances. Kate Lindsey and Joyce DiDonato in Agrippina. Other intriguing cast members: Peter Mattei and Tamara Mumford (Wozzeck); Roberto in Bohème; roles with Matthew Polenzani, Javier Camarena, and the great Željko Lučić. I decided to write this after being informed about the announcement by my dear opera pal Gaby, but before getting back on my beloved opera groups, and I’m intrigued to hear others’ reactions. Similarly underwhelmed? Or perhaps intrigued and inspired? I’d like it to be contagious, if the latter. In any case, here’s to a new season–not to mention, grateful for a lineup of fantastic performers–and, hopefully, pleasant surprises. I don’t have words right now, and must go to work ~ somehow, eyes red from crying ~ but I just heard the news from a dear friend about the passing of our beloved Dmitri Hvorostovsky. With a broken heart, I add my quiet condolences to those of all of his many, many fans throughout the world. Rest in peace, beloved Maestro. Thank you for all the beauty you have given us. Our lives are richer for your presence. You will always be our Beloved Baritone. I have been listening rather obsessively to Jonas’ most recent album of French repertoire, L’Opéra. (That is, when I’m not obsessively relistening to passages from Don Carlos!) One can see and sample, at the previous link, the arias included in this album, from Gounod to Massenet to Bizet, including a gorgeous “Au fond du temple saint” sung with Ludovic Tézier. This album is more “up my alley,” as they say, than the recent Dolce Vita. (But hey, I would listen to Jonas sing the alphabet song, when it comes to that, so I am far from complaining!) L’Opéra is exquisitely sung and orchestrated, and the CD comes in a beautiful cover with a booklet of photos ~ including some of the stunning Palais Garnier which comprises the outside and inside background of the CD cover ~ and the lyrics to each aria, both in English and French. Ah! All is over, finished! Lord, I submit myself to you! where I submit into your hands. but his Christian faith remains. at the dawn of the eternal day. Oh Lord, Oh Judge, Oh Father! It is too bad, in a way, that recordings of the aria in concert don’t tend to include the brief interlude of the chorus of heavenly voices, including that of St. James, as it does in the opera. It of course makes sense…but still, it is so beautiful that I wish it could be included in every version. A few notes on the opera: Massenet’s 4-act opera premiered in Paris in 1885, based on the Pierre Corneille play, with libretto by Louis Gallet, Adolphe d’Ennery and Edouard Blau. The story is one of honor and duty, versus love; of interpersonal and familial struggles within the politics of 11th century Spain. Rodrigue, a valiant warrior who is later nicknamed “le Cid” (“the Lord”), is knighted by the King in Act I, and Rodrigue’s hoped-for marriage to his beloved Chimène is approved. But in addition to these honors, Rodrigue’s father, Don Diègue, is made the protector of the King’s daughter. This act is felt, by the Conte de Gormas (Chimène’s father), to be a deliberate snub to himself. Gormas proceeds to insult Don Diègue, compromising the latter’s honor. In order to regain it, Don Diègue begs his son to challenge Gormas. Rodrigue knows that such an act would estrange him from his beloved Chimène forever; yet, honor bids him fight. Ironically, as my mom has pointed out about the original Corneille play, the very thing that Chimène loves about Rodrigue is his honor; thus, it is a catch-22. I won’t spoil the rest, except to say that the exquisite aria comes in the midst of what Rodrigue believes will be his final battle for the glory of Spain, as he and his army appear to be defeated, or nearly so. I loved this opera, and want to continue to get better acquainted with it. Along with the stunning Act III aria ~ a fulfillment of earlier set-up in Rodrigue’s vision of, and dedication to, Saint James of Compostella ~ I also particularly loved the Act I knighting scene, and the ceremonial chorus of bells and voices that precedes and follows it. Unfortunately, there is no recording, CD nor DVD nor elsewhere, of our tenor singing the title role. So, I looked elsewhere, and found a broadcast which, at the time of this writing, is available on YouTube, from the Washington Opera, with Placido Domingo and Elisabete Matos. I chose this recording first because of the obliging English subtitles. It was a lovely production with spectacular costumes and staging, even if the video quality looks like a VHS recording of a TV broadcast, which might well be the case. It’s a treasure. My second experience of the opera was also thanks to YouTube. It is from l’Opéra de Marseille, 2011, with Roberto Alagna in the lead and it still can be found at this link at the time of this post. I waited on this production, as it doesn’t have the English subtitles, but once I had the gist of the story I was happy to follow along without them. I loved the costumes in this one, and the casting overall. Béatrice Uria-Monzon was a fantastic Chimène. It took me a bit to warm up to her, but I ended up loving both her voice and overall portrayal. She is strong and fierce, without losing a certain emotional vulnerability which is crucial. I felt the chemistry between the two leads, especially in their big scene together before the battle. As to Roberto, he not only has a beautiful voice especially for French repertoire, but there is something about him that makes our hearts go out to him; he is eminently watchable and lovable. His visible distress, his hopeless courage, give one the irrational wish to take him into one’s arms and reassure him. One hears it in his voice: the earnest, distressed appeal. It is irresistible and I was behind him completely. It is this quality that makes Roberto so compelling in the earnest, noble, and self-sacrificing roles. It is what makes him such a lovely Don Carlos, particularly in the French, and a heartbreaking Cyrano de Bergerac. What is it about the French repertoire that is so compelling at this time? From the French Don Carlos, to the French version of Les Vêpres Siciliennes, to Le Cid and L’Opéra…it seems to be a recurring theme at the moment. All I can say is that it is a beauty that has come rather unlooked for, and I’m thirsting for more. As an avid theatre-goer, I am entirely accustomed to modern updates, however seemingly “time-bound” the play–Shakespeare’s history plays, for example. But as an opera, Don Carlo(s)--my favorite opera–has always struck me as one that doesn’t lend itself as easily to any time and setting outside its own. So, when I’d heard that the Carlos I was so looking to was to have an updated setting and a modern ambiance, I was somewhat disappointed. I consoled myself with the thought that I would be hearing the cast of a lifetime in Jonas Kaufmann, Ildar Abdrazakov, Ludovic Tezier, Sonya Yoncheva and Elīna Garanča—conducted by the masterful Philippe Jordan. At worst, I thought, I could close my eyes at times and just revel in the sound, if need be. I have never been happier to be wrong in my life. But it continued to haunt me. By the time I watched some of the live-stream (later that same night after we saw it in person) and then went to see it for the second time on the 22nd, I was deeply in love with the production itself, directed by cinema-lover Krzysztof Warlikowski. It is a combination of an impressionistic silent film, whose imagery is neither overwhelming, nor on-the-nose. Nothing is showy and abstract for its own sake, but leaves one with the tragic sadness of this particular vision of Don Carlos. It is a perfect vehicle for this more melancholy, French-language version of Verdi’s great opera, which is so much more widely known in the Italian. On the contrast between the French and Italian, Zachary Woolfe of the New York Times brings up some fantastic points in his review, linked here. At first, I was mildly puzzled by how the desk and chaise-longue fit into this opening scene in the forest of Fontainebleau, but the impression I was left with is that it is his own retreat—or a kind of exile. Élisabeth enters in a wedding gown—which, as Viv noted, appears to be a direct hommage to Grace Kelly’s wedding gown—in ghostly white, though looking more as though she is going to a funeral. Or, perhaps, as though she has died already. At this point, neither Élisabeth nor Carlos know one another; they only know that their fates are controlled by their fathers, and the cruelty of destiny. Projected images of the various leads fill the set background at key emotional transitions: Carlos, the ultimate tragic lead, is shown at various times looking as though he is on the brink of a nervous breakdown, sometimes lifting a gun to his head. The shadow passing across the face of Élisabeth’s projected image as she accepts the “offer she cannot refuse” ~ marriage to Philippe ~ is rending. A central image is that of the cage—illustrative of the interior cage that each of the characters carries around with them at all times—and this image appears in various guises throughout the production. The set itself is a kind of elegant cage: we see, alternately, Carlos, Élisabeth, or Eboli behind the red cage that appears at various intervals on either side of the stage. Élisabeth uses sunglasses to cage her eyes from view and hide her tormented emotions. Bars across the fencing studio (the Act II, Scene 2 garden setting with Eboli and the ladies-in-waiting) give the impression of a cage. The cage-like shadows across Philippe and Rodrigue during the “Restez!” scene have an understated power. The room where we see Philippe and Eboli lounging in Act IV is a stifling box of a room. We might go on and on. Ultimately, each character is a solitary prisoner, tormented and alone. Again, going back to the cage theme: shadows of the cloistral “cage” fall across Carlos in the cloister of Saint Yuste monastery, only dissipated, for the moment, by the entrance of opera hero, Rodrigue, the consummate honorable and faithful friend, sung so exquisitely by the understated baritone Ludovic Tézier. A white horse stands not quite center stage, for a long period; it is an image that is never entirely clear, and yet, the more I lived with it, the more it felt strangely appropriate, like an image that is part of a “paradise lost”; a future that might have been; childhood; of the moment of happiness at Fontainebleau at the opening; or of nature, and natural emotions, suppressed, cast aside…frozen in time. As to the latter, the production is filled with such indications of natural emotions suppressed or frozen, from the guarded meeting between Élisabeth and Carlos at the opening, to the entrance of Rodrigue, whose affection for Carlos is checked by his sense that they are being watched; and ultimately, to the heartbreaking Act IV arias of Rodrigue, who begs for Carlos to take his hand, and who tries to crawl to his friend as Carlos desperately reaches for him from behind his cage. The notion of a “lost paradise” haunts our characters: Élisabeth longs for her dear France, and her mother, and then, for the love that might have been with Carlos; Carlos mourns this stolen love, and the peace that eludes him, as well as the shadow of his grandfather who spent his final days in the cloister in reparation for a life of power-seeking, as Hamlet is haunted by the ghost of his father. Philippe, in this production especially, has a coherent reason for distancing himself from his son: jealousy. Carlos may be “passion’s slave,” but there is something in him that Philippe lacks: warmth, the capacity for friendship, and the ability to inspire loyalty in such a heart as that of Rodrigue. This is certainly in line, in many ways, with the Schiller original. Ildar’s commanding tone and slick, intelligent presence make him a powerful adversary. His great Act IV aria, “Elle ne m’aime pas,” left me in tatters. Eboli, such a crucial character, is often underemphasized, or is overshadowed by the other leads. Not so here. Elīna Garanča is a force to be reckoned with ~ the ultimate femme fatale as she fences her way into the lives of all the tormented leads, herself as solitary and broken as any. Sonya Yoncheva’s Elisabeth is glamorous, self-possessed, and heartbroken. She sings the role with power, dignity, and restraint. Of course, it is needless to say that I was in tears from the first glorious sound from Jonas Kaufmann. But more than that, his baritonal tenor, his shadowy and emotionally-rich tone are perfect for this haunting version of Verdi’s opera. From the moment he sets foot on stage, he is entirely invested in the role. Of course, Don Carlos must be the emotional center in order for the rest to have its full impact; he fulfills this perfectly. As a teenager, I was obsessed with Shakespeare’s Hamlet. It is no wonder, then, that Don Carlo(s) is my favorite opera, for it is certainly the Hamlet of opera. What has surprised me, after the impact of this production, is my reaction to the French-language version. One becomes so accustomed to the “sound” of the Italian, that its less-familiar predecessor sounds off-putting at the outset. I recall my struggles even to find a recording of the 5-act French version. There is the marvelous 1996 recording with Roberto Alagna and Thomas Hampson; there is the Domingo/Raimondi CD, conducted by Claudio Abbado, from the mid-’80s. And that is nearly all one can find. Now, having seen the live production, it will not leave my sleep-deprived and jet-lagged brain. It has given an entirely new dimension to the Don Carlos obsession. With the Krzysztof Warlikowski Don Carlos, I believe we have one of the additions to the canon of all-time great opera productions–of any opera. The stars have aligned. How marvelous that it has, in a way, “recalled to life” Verdi’s poignant 1867 masterpiece. I will start by saying that I adore Shakespeare’s Othello, and I’m far more familiar with the play than with Verdi and Boito’s opera. (So, you’ll see various “Othello” versus “Otello” spellings depending on which I’m referring to.) But knowing just enough of this opera to feel both its intensity and its difficulty, I was in as much anticipation as any to hear and see the interpretation of Jonas Kaufmann in what has been referred to as “the Mt. Everest of tenor roles.” Combined with this, the ROH’s current Otello is a new production by Keith Warner, and conducted by Antonio Pappano. It live-streamed to many cinemas on June 28th, and will be shown at various dates in the months following, depending on one’s location. Well, I did have an opportunity to see it…and adored it. In my usual fashion, however—more art with less matter?–I won’t even try to be overly succinct. In many ways, it sounds as though Verdi’s Otello—considered one of his great works along with Don Carlo and Falstaff—is the result of a strained bromance. I read a fascinating article (linked here) about the extremely fruitful and long collaboration between Verdi and the librettist Arrigo Boito, who apparently even brought Verdi out of retirement. Boito wrote up his Otello libretto without any hope of its being used nor paid for, but solely as a passion project, “to give V[erdi] proof that I am truly far more devoted to him than he believes.” It premiered at La Scala in 1887. His source, Shakespeare’s Othello, was first performed in 1604, and his own source was one tale from among a collection of Italian tales in the Hecatommithi which were popularized in 1565—and we all know the story, more or less: the noble “Moor of Venice,” married to a Venetian woman, is targeted for destruction by the devilish Iago. Iago is one of the great villains, in part because he seems to delight in evil for its own sake. Not just pot-stirring, mischief-making like a type of Loki figure, but truly delighting in other people’s suffering and his own power to make them suffer. Some of his injunctions to Roderigo even about minor characters—i.e., “poison his delight,” “plague him with flies”–are as seemingly purposeless as they are cruel. And scarily enough, particularly in Shakespeare’s play, Iago, oozing charisma, draws the audience right along in his machinations. We almost become guilty co-conspirators. Bringing it back to Verdi, it is no wonder that he initially intended to call the opera Iago. The eternal question as to Iago’s motive is: Why? “Will you, I pray, demand that demi-devil/Why he hath thus ensnared my soul and body?” (Othello, V.ii.). Why? To quote the wrong play, “that is the question.” The ten-million-dollar question. Is it simply jealousy of Othello, or racial prejudice? 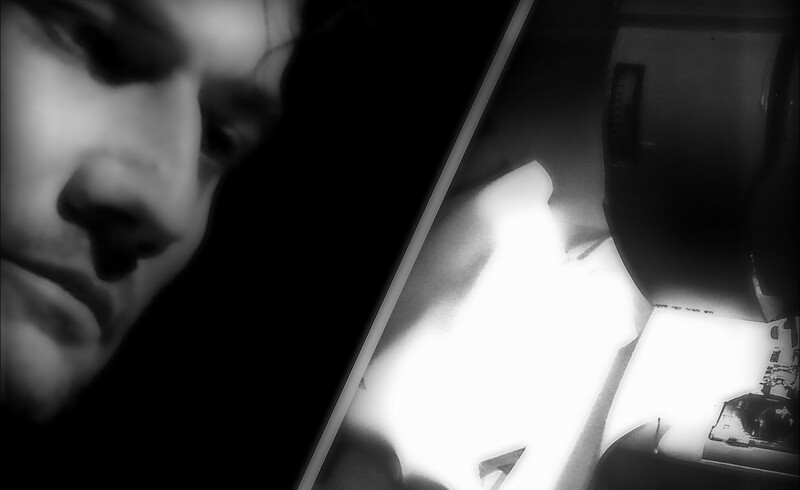 Is it a kind of love-lust of Othello, and jealousy of Desdemona? Jealous of Cassio for usurping his place? Jealous of both of them, for being ranked above him? Or simply jealous of anyone who has any measure of success, enjoyment, or contentment with their own life? We know what Richard III wants. What Claudius wants. What Lady Macbeth wants. But what the hell (yes, definitely hell) does Iago really want? His motive is the consummate puzzle. Coleridge’s note on Iago in his own copy of Shakespeare has become famous: “the motive-hunting of motiveless malignity.” Not that he is without motive, but his motive is something utterly mysterious and cruel: it is “for my peculiar end” (Othello, I.i). Iago’s answer to Othello’s question, and his last line in the play, is equally enigmatic: “Demand me nothing. What you know, you know./From this time forth I never will speak word” (Othello, V.ii.). For the noble “Moor of Venice” is, in some way, an outsider, who has gained great popularity and status through his heroism. Whoever plays Othello/Otello has to make this nobility, the bravery, utterly convincing, for a crucial element of the tragedy to be felt. Thankfully, for Otello the opera, now that we are beyond the embarrassing “blackface” interpretations of yesteryear, we can really explore infinite varieties (thanks again, Will, for your amazing coinages) of motive—either related to Iago’s villainy, or to Othello’s tendency to both suspect and react in the extreme. Motives, perhaps, related to the “green-eyed monster” in both. If there is one potential “problem” in the pacing of the opera, it is perhaps that there is less setup, and hence, less potential payoff. After all, in the play, Iago is planting seeds of doubt, courting the audience and everyone else, and planning his knavery for a full two acts before he plants the idea of Desdemona’s infidelity into Othello’s mind. And yet, in spite of such setup, there is nothing at all extraneous in the Shakespeare play—no digressions nor subplots that don’t relate directly to the main thrust of the action. It’s tight as a drum. In the play, Othello doesn’t dismiss Cassio until the end of Act II, and Iago doesn’t first suggest (to Othello) the idea of Cassio’s interest in Desdemona until Act III, Scene 3—quite literally right smack in the middle of the play! In the opera, both events happen at the beginning, with very little prologue. This was brought up wonderfully by my friend Viv in her review, linked here. So, the music must make us familiar with the characters. And the performers must convey the poignancy of their relationships, and Iago his villainy, with little time to spare. In other words, the music and performance must make up for the lack in length and setup. This is yet another challenge—especially for the Otello—to any who would tackle such demanding roles. What can I say of Antonio Pappano? His lush, dramatic score was yet another character altogether…the opening storm scene utterly thrilling, and everything throughout the opera so fulfilling in this regard as to make one forget what an art it takes to forget the artists who helps make it possible: the conductor and orchestra. Maria Agresta is a very winning Desdemona, who captures well the innocent guilelessness of the character, although I have little to compare her with, as relates to other opera performances. Marco Vratonga is a juicy Iago. He doesn’t have the most beautiful baritone sound, but his gruff energy and sheer delight in malice goes a long way, and personally, I thoroughly loved his performance. In the play, one has more time to take delight in Iago’s extreme two-facedness—the false brotherly love for Othello, and what appears to be genuine concern for Desdemona, Cassio, and Roderigo. Then, he turns on a dime to face the audience and say, “How am I then a villain?”–and did I just see a wink?—and we are, guiltily, captivated. Or, perhaps…ensnared. In the opera, and in Vratonga’s interpretation, it is hard to see the “honest Iago,” as the villain face is so apparent…but it is delightfully devilish notwithstanding. Speaking of the “villain face,” this brings me to the element that I wanted to give a little more focus to, and one which has gotten mixed reactions: the new set design and production by Keith Warner. Personally, I loved both, and found the use of light and dark extremely powerful and effective. The costumes had a certain magical realism; they whispered of the time in which the play was written, and yet belonged to no particular time nor place. Perhaps a number of opera-goers have become a bit tired of the minimalist set design. I will admit to my bias, as I’ve always loved it—but only if well utilized, and if it serves what should be an obvious purpose: to draw attention to the music, the words, the characters. I will never forget a certain live theatre production I saw as a teenager, of Richard III, with all the actors dressed in the same black outfit—often, because the company was small, with one person playing multiple roles—and they utilized just one distinctive piece of clothing (a hat, scarf, etc) to distinguish each character. They would take up or doff each clothing item as needed. But the sheer energy and acting talent brought our imaginations to life, and compelled the listener to hear Shakespeare’s words like the music that they are. Now, I too have become a little tired of “drab” productions, which sometimes overlap with “minimalist.” The recent Vienna Don Carlo was, I thought, somewhat of this variety. (Except for Philip II’s, ahem, gorgeous costume… 😉 ) It had all the rather spartan, blue-grey dullness that is a bit lacking in ingenuity. Okay, frankly, I think it’s a bit lazy. This production, however, utilized a stark black/white/red design to perfect effect: it was the chiaroscuro of the soul. It begins in utter blackness. Iago then appears in spotlight, holding a comedy and tragedy mask: the comedy (a white mask) in his left hand—and for the audience, it is the one on the right—and a black tragedy mask in his right hand, and our left. After looking at them, he tosses the comedy mask to the ground with a devilish laugh, looking at the audience. This immediately connects to what I discussed above: the possibility of so many other themes and motives than solely race, or rank-jealousy; all are intertwined with one another, with the over-arching tendency to destroy and bring the “other” down. To destroy happiness in the “other.” To destroy. Period. It brings up a possible further motive for our ever-elusive Iago: he is out for the soul. As in the play, he is out to “turn [Desdemona’s] virtue into pitch,/And out of her own goodness make the net/That shall enmesh them all” (Othello, II.iii). In this production, one has the feeling that Iago wants not only to turn the appearance of virtue into pitch (again, the light/dark theme), but to turn their own souls against themselves and their better nature. Perhaps, to damn themselves, using their own weakness to their disadvantage. In this way, we might connect it to Iago’s chilling “Credo” aria: what he’s actually battling is a “cruel God,” rather than Otello, Cassio, or Desdemona. An effective way to, essentially, give the finger. It is odd, how in Verdi’s and Boito’s interpretation, Iago seems to buy into an odd sort of predestination: we are all “slime”; “I believe the just man to be a mocking actor in face and heart” (“Credo che il giusto e un istrion beffardo e nel viso e nel cuor”); that he himself does what he does by “destiny’s decree.” (Here, I would advise the opera-Iago to listen to another epic villain, Edmund in King Lear, I.ii: “This is the excellent foppery of the world, that,/When we are sick in fortune,–often the surfeit/Of our own behaviour,–we make guilty of our/Disasters the sun, the moon, and the stars, as/If we were villains by necessity; fools by/Heavenly compulsion…”) Or, perhaps, Iago sees himself as destined to be the shadow that opposes the light. Hell’s compulsion, if you will. Or, “divinity of hell” (Othello, II.iii). The production brings out this soul-battle with haunting power. From the general “darkness” of the set, to Otello seeing himself in Act II, masked, in a mirror, right after he is nearly ready to kill Iago for planting this seed of doubt in his mind. Later, before the final scene, as Otello descends into madness, Iago proclaims “victory” and the joy of being able to crush this “lion of Venice” under his feet…then proceeding to cover Otello’s mad-vacant face with the black mask of tragedy. Overall, I doubt that it is only victory over Otello he wants. After all…why? I think Iago has bigger fish to fry. Send words of love and support to our tenor! Many of us want to express our warm love and support for Jonas Kaufmann during this time of his recovery–a recent article has highlighted this–and there are many ways to do this, especially via his Facebook page. One sweet friend, Basia (Barbara Gawel), a great admirer of our tenor, proposed sending postcards–in her words, “with good wishes and thanks for his unique art”–suggesting perhaps cards featuring “plenty of roses”. It would be a delight to hear about all of the love and support coming in for him from all over the world. Beautiful idea, Basia! We’re here for you, Jonas! I tried to put my picture in the comments, but apparently it won’t do photos. So, here it is. Perhaps one of us can put a little photo collage together ~ it would be fun to hear of what parts of the world they’re coming from! But either way, the important thing is that they are sent. Write on, friends!